Sign into the Azure Portal as a tenant admin. 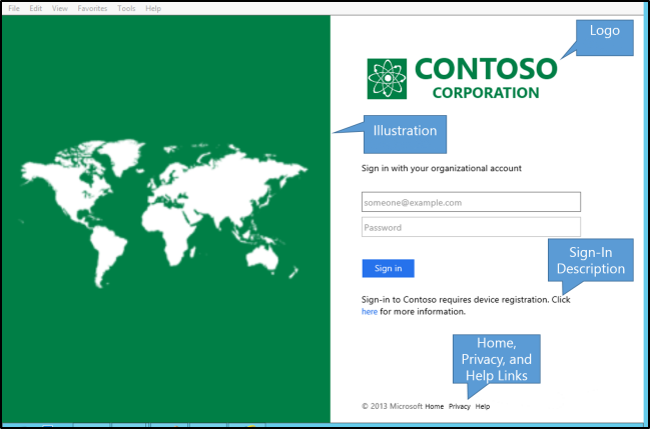 Navigate to Azure Active Directory –> Company branding. Click Edit to configure the needed settings. Fill in all the customizations. A square logo, 240 pixels by 240 pixels, PNG or JPG, 10KB or smaller. A banner logo, 280 pixels by 60 pixels, PNG or JPG, 10KB or smaller. A background image, 1920 pixels by 1080 pixels, PNG or JPG, 300KB or smaller. If you need to resize existing bitmaps, or reduce the size of existing bitmaps by reducing the color pallet, you may need to use something like Paint.NET. (1) and (5) correspond to the “square logo image” (240x240px). Also note that you can have Intune present a “terms and conditions” page (presented in a web view as part of the MDM enrollment process). See https://docs.microsoft.com/en-us/intune/terms-and-conditions-create for details on how to set that up. Thanks been searching everywhere to find where i can find the ‘name’ field.